VERY cool! I love the dark tree silhouette over the bright yellow die cut. And the eyes are ca-ute! LOTS OF CUTTING! WOW! Looks great Libby & thanks for joining us this week! This is too cute, Libby and LOVE how you cut out the tree trunk! That had to have taken some major patience! The colors are great, too! I LOVE it! This set is awesome, isn't it? Great colors....I just love that tree! sitting in the hotel here...but had to tell you that I LOVE this card...you are a perfect fit for their Halloween sets! Super CUTE! Love the colors!! O...M...G! I thought I had seen ALL the blogs...how did I miss THIS?! That tree looks FABULOUS up on the foam dimensionals! Those eyes too! You cut out the EYES? You must have teeny tiny hands...or teeny tiny scissors...or both! LMAO! This ROCKS! Beautiful card!! Love this layout and those colors are really stunning! 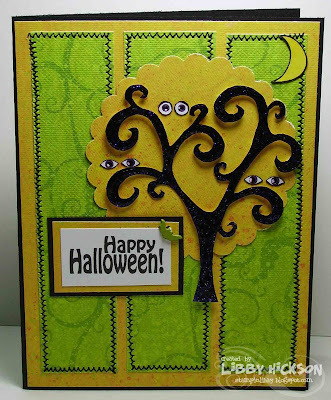 Love these bright colors and the creepy peepers from behind the tree! Wonderful Halloween card! I just love this holiday! Oh!! Love this, the sewn panels and the eyes peeking out from the tree, LOVE it!! WOW! This is amazing! LOVE it Libby! Thanks for helping us out this week! ACK!!! This is waaaaay too cute! Love it!! !